Image 1 of 36. Click to view fullscreen. This villa, located in Canidelo, is ideal for 8 vacationers. It offers 4 bedrooms, a private pool and an enclosed garden. The lounge is perfect for unwinding after a day of exploration. Curl up on the comfortable sofa and enjoy a good book in front of the fireplace or take advantage of the amenities on offer, including an iPod docking station and a radio. The kitchen is well-equipped for cooking up your favorite meals. Enjoy your feast around the dining table which seats 8 or outside, on the balcony, on the terrace, in the garden or in the garden enjoying views of the swimming pool and the mountains. The villa has 4 comfortable bedrooms, 1 including a double bed and a private bathroom with a bath tub, a shower and toilet, 1 including a double bed, 1 including 2 single beds and 1 including a sofa bed. Several bathrooms are available, one with a shower and a toilet and one with a bathtub, a shower and a toilet. The villa features cleaning products, ironing equipment, a washing machine, air conditionning, a dressing room, a jacuzzi, a desk and a vacuum cleaner. Note that the cleaning, towels, bed linen and tourist tax are included in the rental fee. Parking is available onsite and is private. Smoking inside is not allowed. Pets are not allowed. Parties are not allowed. Passamos uma excelente semana de férias!!! A casa é muito confortável e muito bem localizada. I stayed for a week and I highly recommend. It was a family vacation. Unfortunately during this time of the year, the weather isn't warm enough to try the pool, but it was a good to go for a walk around there and also there's a nice park where you can spend a few hours doing some sports or laying down staring at the sky and trees. 10 min away you get to the beach, it is really beautiful! I'd recommend to use bikes and take a ride along the sea. The place is super comfortable and it has a fireplace that heats the whole house. 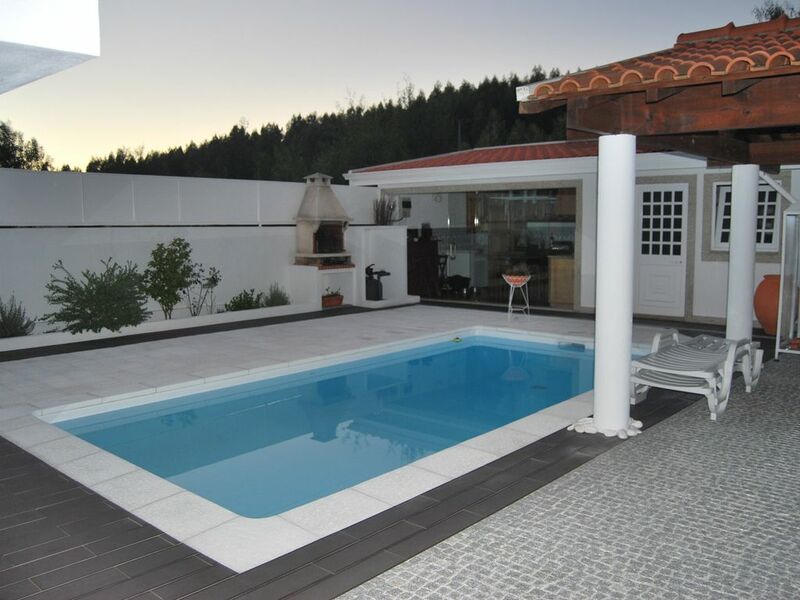 a very confortable home in a small village, with trees arround...very clean and with a great swimmimg pool for fun. very close to the beach (5 minutes away). The best for a great familly holliday! Casa perfeita para uma estadia em família ou com amigos. Bem localizada. Excelentes condições! Recomendo vivamente! Excelente atendimento, comodidade e conforto. This villa enjoys a privileged location that will allow you to enjoy your stay in the area. Many activities await you in the surroundings, such as Horse riding, Fishing, Mountaineering, Cycling, Paragliding, Hiking, Golfing, Sailing, Water sports, Snorkelling, Swimming and Windsurfing. Mindelo beach is 10 km away from the villa. You will also find great bars and restaurants at 8 km and a supermarket within 500 m. Estela Golf Club golf course is 23 km away from the villa.